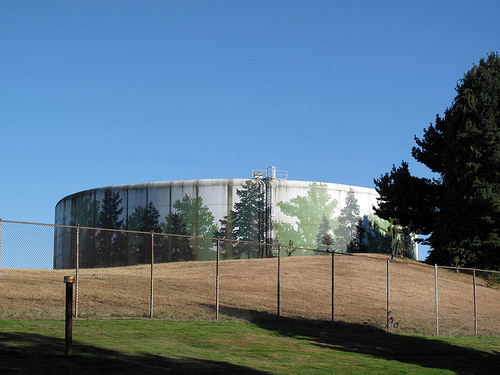 The Alaska Street Reservoir is located on the south side of South 19th Street between South Wilkeson and South Ainsworth. There are trees painted on the side of the reservoir and for something so large it blends surprisingly well. The reservoir provides drinking water for the city of Tacoma. This entry was posted in Government, Tacoma, WA State - Pierce County and tagged Alaska Street, reservoir, Tacoma, WA on September 6, 2011 by admin.